I feel Hap-py, that is I feel in the mood to make something a little bit like a Hap shawl. A Hap shawl with a twist, if you will. Here's a link to see what a Hap shawl **should** look like. Quite interesting and I love their blocking frames. Mine won't look like those because I only have so much yarn and I will not be doing the big square centre. I'll be doing a triangular main section, which hopefully won't look a million miles away from the proper patterns because the big squares are usually folded in two on the diagonal for wear. I'm making mine in the Cashmere, Angora and Lambswool plant-dyed yarn I got from Shilasdair in 2005 during some island adventures. It has been living in the spare room waiting for a worthy project to be involved in. It feels absolutely marvelous, and I'm hoping it has the potential to become a lovely somewhat Hap-shawl. The clincher is that I have twice as much of the neutral oatmeal shade as any other colour, so it can be the main triangular section. It knits like a dream but two observations: it smells like plants and when you stand up you look as if you have been snuggling a giant bunny. 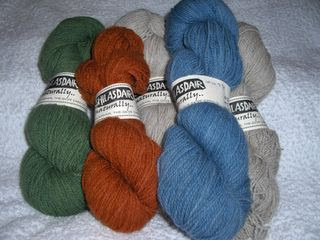 Wow, Cashmere Angora and Lambswool - that is a Hap-py shawl indeed. Look forward to seeing it being knit, it sounds wonderful! Triangle or square, like it matters! Anyway you do it it'll be great!